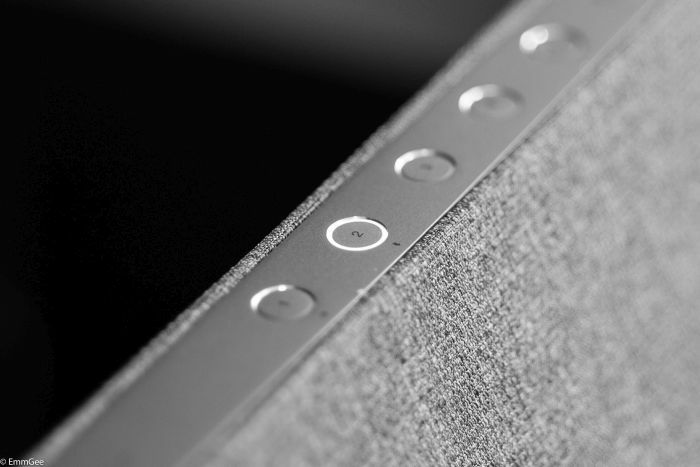 The KEF LS50 wireless speakers are based on the legendary KEF LS50 passive studio monitor speakers. The difference between them is that that the LS50 wireless are active speakers, which means that you don't need a separate amplifier as they have amplification built in. Many people think of lots of separate boxes and cables when they think of Hi-Fi systems and many years ago this is exactly what is was - and many people still want that. However, what if we could combine speakers with built-in amplifiers, a music streamer and a pre-amplifier to plug in a turntable or a digital source like a TV or a set-top box? This is what the LS50 Wireless can offer, a complete, neat and most importantly an amazing sounding music system. Lets have a look at them and see what is supplied in the box. In the box you'll find a quick start guide, a remote control, 2 power leads, 2 Ethernet leads and a USV cable (USB A to USB B). 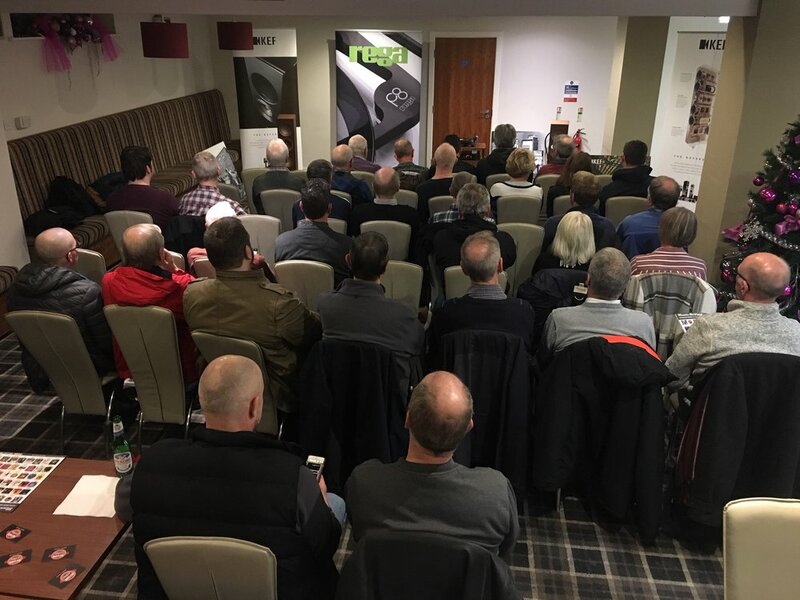 The LS50 Wireless loudspeakers are available in three finishes, gloss black with blue drive units, titanium grey with red drive units and gloss white with copper drive units . The idea to call them wireless doesn't mean that you don't need wires to connect them mind you! The difference is that you don't need as many cables in a system with separate components. I will explain that now. The speakers are arranged in a master and slave configuration. Your sources connect to the master speaker, which is then connected to the other speaker with a supplied ethernet cable. Connect a power cable to each of the speakers and for greater stability, we hardwired the master speaker to our network via another ethernet cable. There is also a wireless set-up option available. There are controls on the back of the master speaker for different speaker placements, like close-to a wall or free space positioning, desk or stand support. On the back there is one set of analogue inputs, a digital optical input, a USB B input and a subwoofer output. The Network socket allows you to connect the master speaker to your router/switch and the output socket to connect the master speaker to the second speaker. Music can be selected from services like Spotify, Tidal or Qobuz and any music stored on a NAS using the IOS/Android control app . Bluetooth support makes life easy if you want to play music directly from your phone or tablet. We started streaming with electronic music from Tipper's Album "Forward Escape" and the LS50 Wireless offer impressive bass performance. This is not a big speaker but you will be surprised what they are sonically capable of. All clicks and pops are so clean and crisp, these speakers really draw you in. We then listened to London Grammar's Album "If You Wait" and we were impressed by the big sound stage and clarity of the vocals. Another great Album is Felix Laband's "Dark Days Exit". The track "Red Handed" is a good system tester and we were blown away again. Huge sound from such a small speaker. As a bonus the LS50 wireless are Roon ready and can be selected from the Roon app as an endpoint (player). It’s barbeque season and the sun has decided to grace us with its presence. We thought you all might be like to see what may be available to enjoy your music in the garden, down at the beach or if you are braving the British countryside whilst camping. We have chosen two of the best portable solutions on the market for your summer activities. We love the performance of the Dali Katch Bluetooth speaker and the Ruark R1 Mk3 DAB with battery pack. First we will take you through the Dali Katch and what it offers. We touched on this wireless speaker last summer but thought we would give you more in depth look, seeing as the sun has decided to come out for an extended play this year. Available in three different colours dark shadow, green moss and cloud grey the Katch is extremely stylish and robust. Sporting Bluetooth 4.0 with Apt-x and NFC technology the Katch is ideal as a “go-anywhere” speaker without compromise. As well as the Bluetooth connectivity this speaker includes a 3.5mm jack input for any devices that may not output Bluetooth. This portable speaker has dual drivers powered by a 2 x 25watt class-D amplifier. The 2 x 3.5inch aluminium woofers and 2 x 21mm soft dome tweeters deliver a large and powerful performance from the robust aluminium body. 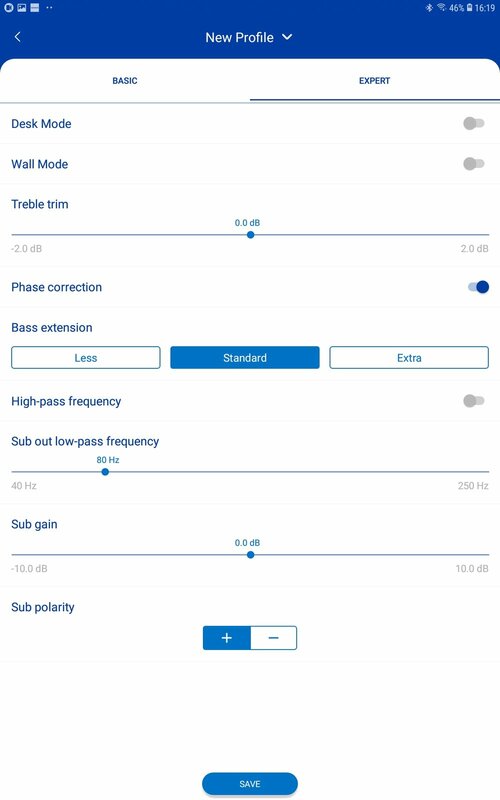 You can tailor the sound of the Katch using the 2 audio profiles, clear or warm so if you like your bass the warm function gives great extension and size to this frequency area. Overall the sound from the Dali Katch portable loudspeaker is powerful and full bodied just how we like our wine. Timing and dynamics are definitely superior to other Bluetooth speakers on the market. In the box are the charging adaptor and a carry case to protect your speaker. The battery at full charge will give you up to 24 hours of play time and there is a USB charge output, making it ideal for a weekend camping trip where you may be “off grid”. The Ruark R1 Mk3 is a tabletop DAB radio with Bluetooth connectivity. Bought on its own this deluxe Bluetooth radio is a mains powered unit that sounds superb and is available in three colour finishes, satin black, satin white and rich walnut. With 2 alarm clock settings the R1 is ideal as a bed side radio with great snooze functions as well. Enough of the indoors, let’s get out in the sun, here comes the clever bit. Ruark offer a battery pack for this little beauty making it ideal for carrying into the garden when the sun is belting down. The battery pack is small and light and bolts on to the rear of the R1. Once fitted this can be left in place and switched on and off when needed. At a full charge this battery pack will deliver 12 hours of listening via Bluetooth from your mobile device or DAB, DAB+ and FM radio on the go. The Ruark battery pack can also be fitted to their more recently released MR1 Bluetooth speakers. This is definitely one of the best sounding radios you can buy. With clear and very precise sound for a single box radio the R1 Mk3 delivers great sound offering great functionality. So whether it’s enjoying your favourite DAB stations in the garden or keeping up to date with the football scores when you take a trip to the sea side the R1 Mk3 should not be underestimated. The sound is incredible for a single speaker radio in such a tiny box. Both the Dali Katch and Ruark R1 are available for demonstration in store so why not pop in for a demonstration while the sun is still here! Thanks to Svago Italian kitchen and bar for letting us use their resturant as a backdrop for our photos! Ruark Hi-Fi products are available from all branches of Audio T.
Dynaudio Music: Is Music To Our Ears. Introducing the new Music wireless speaker and multi-room music system from our Danish cousins Dynaudio. This new range of wireless Hi-Fi speakers offers a fresh design and style which can be used in any room of the house including the garden. The new range consists of 4 speakers. Intuitively named the 1, 3, 5 and 7. 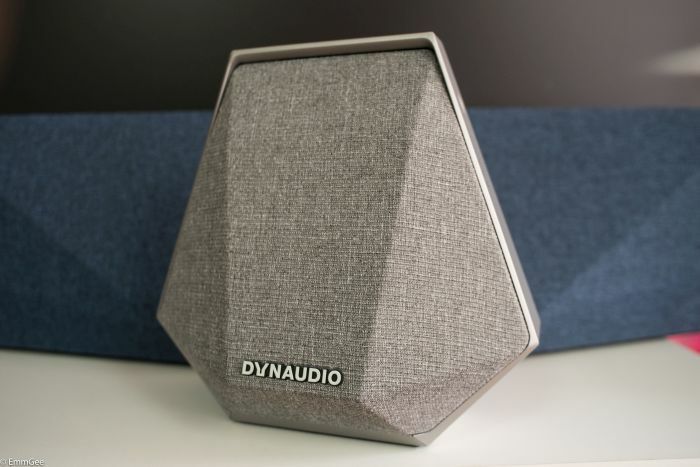 Dynaudio has tried a new approach to the streaming market, introducing their new algorithm which adapts to the music you listen to, with intelligent suggestions and playlists so you only have to press play and listen to hear your favourite music. From installation of the app on Apple and Android, Dynaudio have a brilliant genre building process which is rather charming. First you select your favourite artist, which then proceeds to offer you similar artists. Quite therapeutic for discovering how many artists you actually like! Pop culture aside, getting down to what the Dyanudio Music actually does is pretty impressive. Learning your musical tastes and playing automatically generated playlists is very clever. 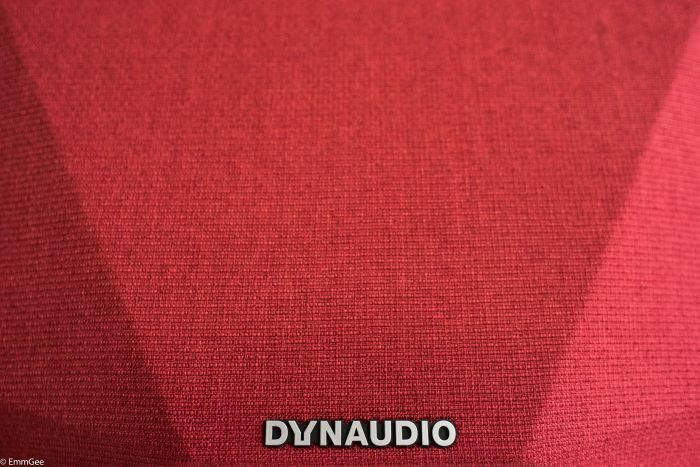 The Dynaudio Music 7 is the largest of the quartet and this is reflected in the sound quality, the extra room for the bass units and the positioning of the tweeters at far outer edges of the chassis helps the sound stage massively. Our shop floor isn't small yet the 7 fills that space easily. The Music 5 is the second largest of the bunch and is equally adept at filling our shop floor with sound, albeit with a smaller sound stage but exciting nonetheless. 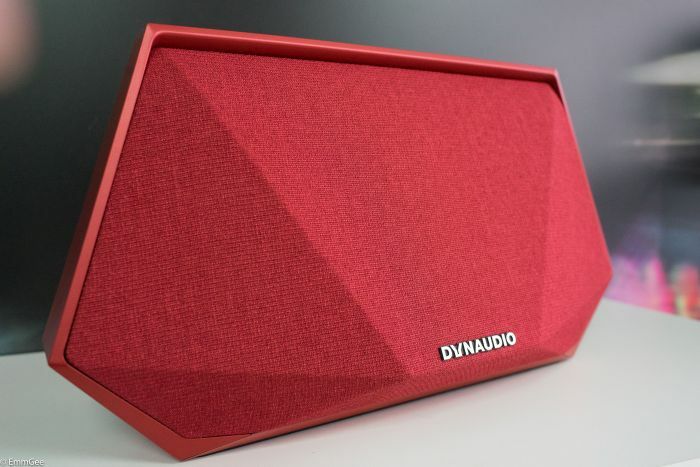 We then have the Dynaudio Music 3 in a red finish which also has a built in battery, making it portable enough to stick in a corner of a snug. And the diminutive Music 1 which also has a battery, is great around the house and the caravan or when you're out and about. The Music 5 seen above, has a bass reflex port to help improve and control bass. Chromey!! I wouldn't lie there, those ports can shift some air! 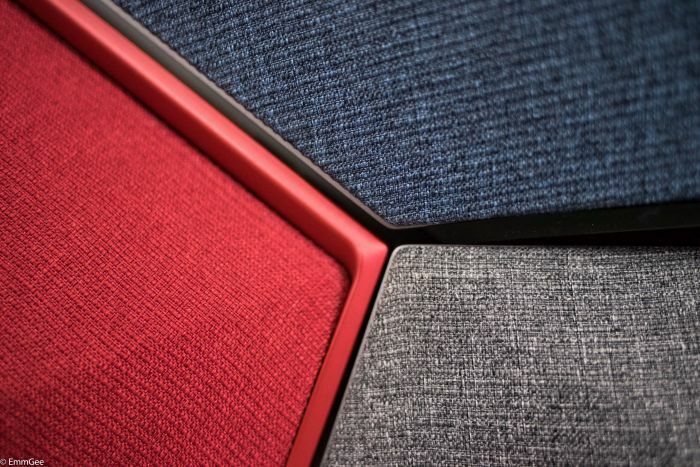 The Dynaudio Music speakers come in 4 distinct colours. Light Grey, Dark Grey, Red and Blue. The, Music 7 has a larger bass port which moves much more air in accordance with the size of the unit. No Chromey, I haven't seen the rest of your body, and I did warn you! There you have it, the new Music from Dynaudio. They are all on demonstration at Audio T Manchester. 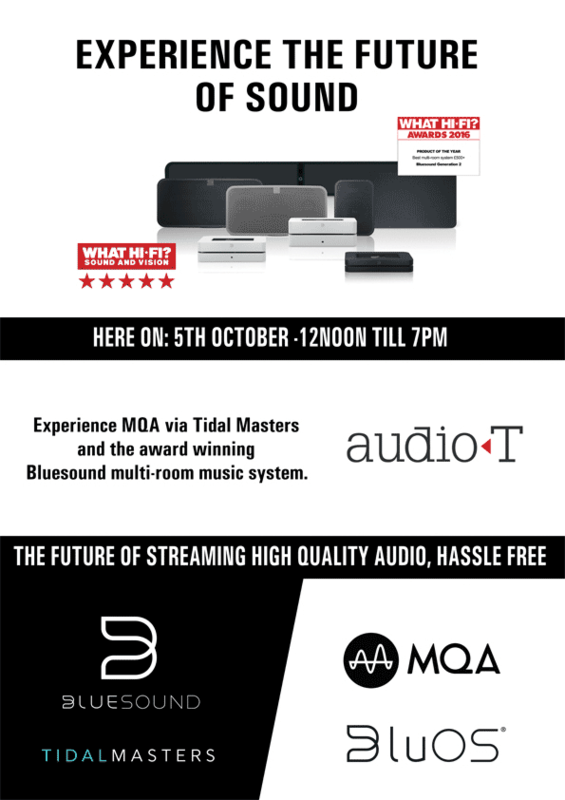 Come along a take a look and listen at Audio T Manchester. Munir, Dave, Mike ,Simon and Haden. In this months Blog we are focussing on Bluesound multi-room music streaming products and will show you how easy they are to set up and tell you why it is so good. Bluesound is an award winning wireless, multi-room system that supports Hi-Res audio replay and has been designed to fill your home with high quality sound. It has a sophisticated but easy to use operating system (BluOS) which we will talk more about later. Music streaming services like Tidal, Qobuz, Spotify, Deezer, Amazon Music, Internet Radio and many more are supported and the system supports up to 64 players to fill your rooms with high quality sound. In addition you can play music from your NAS drive (network attached storage) USB drive or via Bluetooth from your phones, tablets and PC's. The Bluesound system connects via your home's Wifi network (your broadband router) or hard-wired via ethernet cable to the same router. You can control it with the BluOS Controller App for iOS, Android, Kindle (phones or tablets) and there are desktop apps available for Windows (PC) and OS X (Mac). 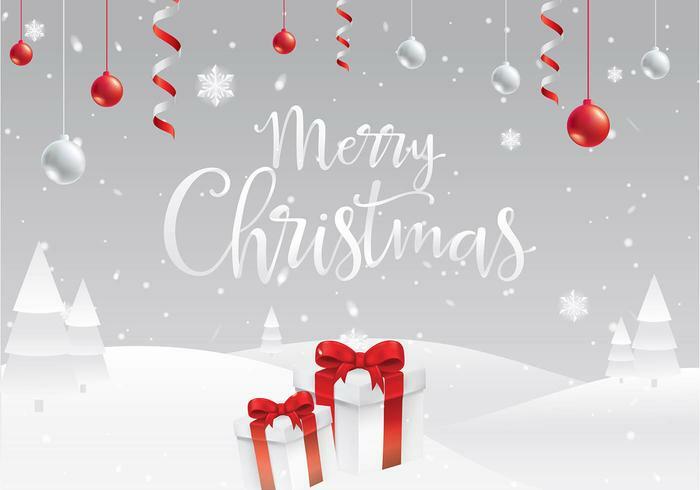 Supported file formats are MP3, AAC, WMA, OGG, WMA-L, ALAC and OPUS as well as Hi-Res formats FLAC, MQA (Master Quality Authenticated), WAV and AIFF from 16Bit (CD Quality) to 24Bit (Hi-Res Audio). Let's take a closer look at the products. The Vault comes shipped with 2TB hard drive and allows you to rip your CD collection to the streaming formats FLAC (lossless smaller file with no degradation in quality) or WAV (original copy - large file which takes up more space on a hard drive). It is very user friendly and requires no computer for the initial set-up. Like every NAS (Network Attached Storage), just plug it into your router via ethernet cable, get the app for your control device and you can start setting up the Vault 2. The Bluesound Vault can be used as storage/server and as a player. You can use the analogue or digital outputs on the back and connect the Vault 2 directly to your music system and away you go. All Bluesound players or speakers can access the music stored on the Vault 2 . The Pulse Flex can be used as a single speaker or you can buy two and set them up as a wireless speaker pair. Attach a rechargeable Battery Pack and you can take wherever you go. The Pulse Mini and Pulse 2 are bigger and more powerful. Great if you want more bass and a bigger sound. There are sound controls for bass and treble adjustment if you need them. All 3 speakers support Bluetooth, have an analogue and optical input - plus a headphone socket. 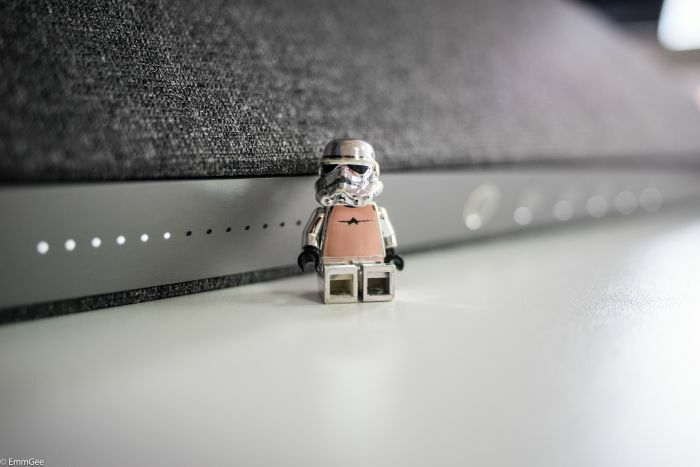 Node 2 - The Node 2 connects to your existing stereo or home cinema system via analogue connection (with fixed output option) or digital coaxial outputs. It is compact and sounds fantastic. I have (Stefan) got one myself and I all I can say is - It sounds stunning, really stunning. Powernode 2 - The Powernode 2 does everything the Node 2 can do, plus it can drive a pair of stereo loudspeakers. This is great and gives you various options for use in-ceiling, outdoors or to use as streamer and amplifier connected to an existing set of speakers. With 60W per channel you can choose from a wide range of speakers for your home or office set-up. Both work wirelessly and that is also how they connect to each other. You can play all the music that I mentioned above through the Pulse soundbar with or without the Pulse subwoofer. Our suggestion is to use a subwoofer and you can even use one from a different brand, such as a REL. Now add two Pulse Flex speakers as wireless surround sound speakers and you have a 5.1 home cinema system - very flexible! Open the BluOS app and bring in your speakers or components. This is very easy. You can see them in a list on the right hand side. Select one and play your music or group some of them and play your music in several rooms at the same time. On the left hand side you see your players inputs, music streaming subscriptions and access to the player settings. All Bluesound players and speakers are compatible with Roon if you want to take streaming music control and sound quality to the next level. There is so much more we can show you about streaming music via Bluesound, however as always your ears and eyes need to be the judge, so please feel free to email us or call us on 01793 538222 or if you're live locally just come into the Audio T Swindon shop. The New Ruark MR1 MK2 Speakers Have Landed In Oxford. Over the last couple of years if a customer asked for inexpensive desktop speakers, our recommendation had always been the brilliant Ruark MR1 speakers. These compact speakers were fantastic value for money and could not be bettered for the price. The MR1 desktop Bluetooth speakers are now four years old, so Ruark has decided to update them and here we will review the new MR1 MKII. The drivers are the same as before, but Ruark has made changes to the crossover to help give the MK2 version a bigger more open sound. Style wise Ruark have done away with the removable grilles of the MK1s and in their place is a fixed version. There is no denying that the appearance and quality of finish is a marked improvement over the Mk1s. The MR1 Mk2 are a two-way bass reflex speaker system utilising a 20mm treated textile dome tweeter and a 75mm long throw bass driver, with a powerful neodymium magnet. The MR1s have a built in 20W Class A-B linear amplifier incorporating a high quality switch mode power supply. 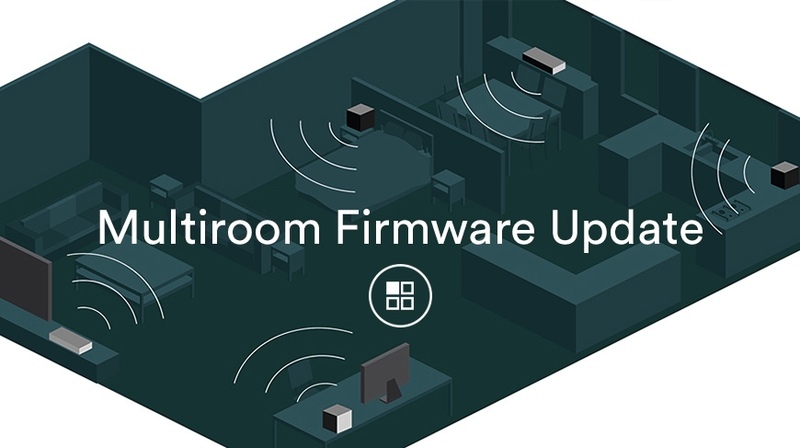 The MR1 Mk2s now have an optical input so you can connect external devices such as your TV or Chromecast Audio etc, to improve the sound. They also offer apt-X Bluetooth for CD-quality streaming from compatible devices (Laptops, Phones, some TVs etc) and an analogue input for connecting a turntable. To complete the package and to offer a great upgrade path they also have a subwoofer output for connection to an active subwoofer. The Mk2 Speakers provide a sound quality and scale that belies their price and size. We listened to a variety of music from Ella and Louie singing “Summertime” to more testing music from the likes of M83s “Hurry up we're dreaming” and the Mk2s never skipped a beat. The performance was superb without any hint of boxiness and the bass extension was deeper than expected for such a compact design. These speakers may not be able to fill a large room but if required you could partner them with an external powered subwoofer to provide a great compact speaker solution. The MR1 Mk2s are available in Rich Walnut and Soft Grey Lacquer finishes. An optional BackPack II power pack is available to free the MR1 Mk2 from the shackles of mains power (the slave speaker can be removed completely for ease of portability). We have them on active demonstration in store, so please come by and have a listen. Feeling bluesy or kind of blue or any type of music genre for that matter? Then that nodes well, because we may have the tonic you're after...read on. Turn your Hi-Fi into an intelligent 21st century all singing all dancing triple threat*. Bluesound is now on sale and available for demonstration in Manchester and we couldn't be happier. *Broadway speak for someone who is multi talented. Here we take a look at the Node 2 streamer. With all the usual connections you would expect from a mid to high end streamer, optical, coaxial, analogue audio out, subwoofer out too. And of course a digital and analogue input. With a 1GHz ARM cortex processor as its brain, the speed of Bluesound never ceased to impress, loading album art, playlists and Hi-Res media to multiple devices is flawless. Having plenty of inputs and outputs means there really are no limitations to the Node2's capabilities. Stemming from a partnership with NAD, Bluesound has evidently taken on board application advice from NAD, who have been in the audio business since 1972. Hi-Res audio in all your rooms simultaneously is Bluesounds unique selling point, and MQA is one of the options available via Tidal. MQA Tidal streaming is simple and rewarding. The Bluesound app is speedy and intuitive, you are free to edit and manage playlists on the fly, whilst browsing MQA selections. Being able to easily demonstrate back to back red-book 16bit 44.1KHz, to 24 bit up to 192KHz, tracks felt more immersive and dynamic. Roll-off and reverb from snares, claps and vocals seemed to hang on just a moment longer compared to that of CD, sounding far more natural and almost painting the picture of the room in which they were recorded in your mind. In regards to the app, there are really no complaints from us. In fact we all agree that it is very evident that a lot has been invested into the development of it. Locating our files from our NAS with ease, as well as other album suggestions on Tidal in the same window offered trouble free and seamless streaming. Combined with a little emoticon indicating the resolution of the file type currently playing, this kept us informed of the tracks we were playing in real time without having to open the 'Track Info' page. This made demonstrating CD vs MQA quality simple and eye opening too! Overall though, we were impressed with how the Bluesound makes the most from its software, and in this digital age of iPhones and tablets, applications and Airplay, it is easy to forget about the hardware side of things. Bluesound breaks down this barrier between software and hardware with a solution so simple and innovative it is almost charming. Being able to code your Bluesound to work with any IR remote for example, the ability to assign functions on your TV remote to control the volume of your BlueSound, Pause, Play, Power off and on, let's say someone calls you while you are listening to music through the BlueSound but have the TV on in the background, you use the TV remote to pause the the music, while you take the call. This, simply put, is a lovely feature. Hats off to Bluesound. We have a healthy selection of Bluesound streaming products in Manchester, from the range of all in one wireless speakers like the Pulse 2 and Pulse Mini, to the amplified version of the Node2 the PowerNode 2 integrated amplifier and also the Vault 2 which lets you rip your CD's and store your music on the 2TB music server.